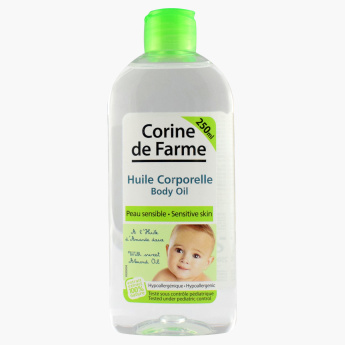 Corine de Farme Baby Body Oil - 250 ml | Multicolour | Corine De Farme body oil is specially developed to moisturize the baby body, face and scalp. Give your baby the ultimate moisture for the child's dry skin by getting this baby oil. It consists of almond oil that helps in rejuvenating the baby's dry skin and to help in softening of the skin. Feature 1 : Corine De Farme body oil is specially developed to moisturize the baby body, face and scalp. Feature 2 : Enriched with sweet almond oil which leads to nourishing and softening quality.